Peggy and her husband Jay Byrne traveled to Fondwa, Haiti, at the end of October. They shared highlights of their trip in a presentation Dec. 13 at Sacred Heart. “We wanted to go over there for various reasons, but one of the major ones was we wanted to see what we could do to help and what they actually needed over there,” said Jay. 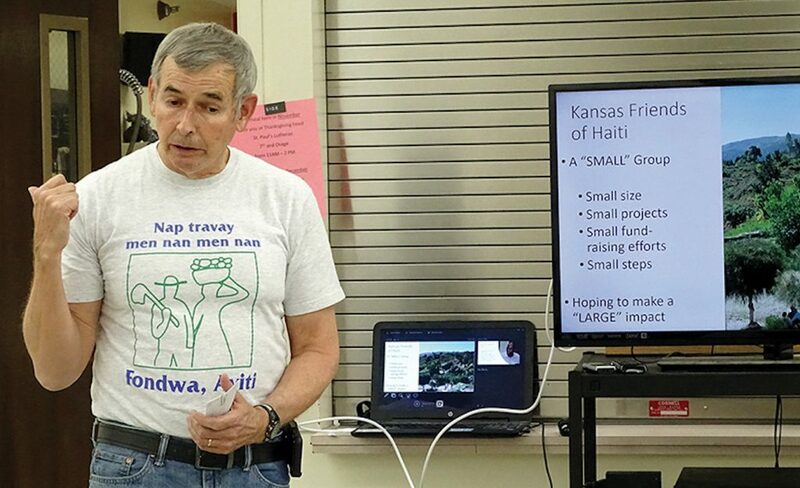 The Byrnes are two of five Sacred Heart-St. Casimir parishioners who are members of the Kansas Friends of Haiti. Formed about 18 months ago, the group’s mission is “to improve the lives of the people of Fondwa and surrounding areas through small projects undertaken at a grassroots level,” said group member Keith Hustings. The group is helping to continue the work of the Sisters of Charity of Leavenworth. “The Sisters of Charity have long supported the ministry of Father Joseph Phillippe,” Hustings said. Father Phillippe, through the Father Joseph Network, created four organizations in Haiti to work on the economic growth in Fondwa for the rural areas and create wealth and job opportunities, Jay said. The four organizations include the Sisters of St. Anthony who run four convents, several schools and three orphanages; the University of Fondwa, which includes three schools of study — agriculture, veterinary medicine and business; the Bank of Fonkoze, a microloan bank; and the Association of the Peasants of Fondwa, which includes providing a medical clinic and veterinary clinic and working to improve infrastructure and economic development. Peggy Byrne said they were able to witness firsthand the economic struggle. First, the Byrnes were able to see what the group’s contributions have already done to help. Since it formed, the group has been able to fund a visit for veterinarian Dr. Alcime to Kansas in May 2017 for educational opportunities at Kansas State University Veterinary School, local dairy farms and large animal vets; purchased $1,400 worth of veterinarian supplies; purchased solar panels for one of the convents — the Sisters’ main source of electricity — from a $1,000 donation provided in December 2017; provided Christmas presents for the preschools, from a $500 donation provided in December 2017; supported the Sisters of Charity’s purchase of sewing machines for the trade school; and provided administrative support for Father Phillippe. However, the knowledge that more needs were still to be met was clear to the group. The goal to understand what projects need to be focused on next proved successful. The group hopes to donate a motorcycle tractor to the University of Fondwa to support the agricultural school and transport drinking water, a $2,000 project; solar panels to the new convent, which is currently being built, a $1,000 project; provide a $1,000 cash donation to the medical clinic for supplies; a $500 cash donation to the preschool for school supplies; a $500 cash donation to the vet clinic for supplies; and help with economic development by providing knitting instruction, product development and marketing in the hope of helping the Haitians to effectively use available teaching and marketing talents. Group member Bill Bassett said learning of these needs only motivates the mission of the group more. For those interested in supporting the cause, send an e-mail to Hustings at: hustbears5@yahoo.com. For more about Father Phillippe’s ministry, visit the website at: www. fatherjosephnetwork.org.